I have a deep love for sweaters and coats, and, along with shoes, it's probably where I get myself into the most trouble during the Nordstrom Anniversary Sale. This year the coat selection, in particular, has some AMAZING deals. I know it's tough to think "cozy outerwear" in the middle of summer, but it's worth it for these deals. It's GO time, ladies. The Nordstrom Anniversary Sale is Here! It's the most wonderful time of the year. This season's hottest pieces on sale for a limited time, before going back to full price for the season. There are SO many amazing options, so we are giving you the scoop on the best items, in our humble opinion. We will post on the best kids, makeup and accessory finds coming up, so be sure to stay tuned in. Spring & Summer Finds Under $25! Did you guys catch our post last week? We shared our favorite items from the Nordstrom Half Yearly Sale. The sale officially kicked off last week and runs through June 4th. I have already shopped the sale more than once and wanted to update you all on my newest favorites. There is so much on sale that I was able to find some summer staples for you all that are all under $25! Don't forget to check out the Men's sale items, too! Father's Day is just around the corner and there are some awesome picks for dads like this blue check shirt, this faux leather card case, and these Ray-Ban sunglasses. It's here!!! The Nordstrom Half Yearly Sale!! Have you heard? The Nordstrom Half Yearly Sale has officially begun! It's running now until June 4th. Almost everything is 40% off from women's clothing to men's clothing to accessories and home and more! This is one of our favorite times to stalk up on items for the present and the upcoming season. It's a lot to sift through though, so we've done the hard part for you. We've found the best of the best of the sale and categorized it all below. Everything we've found that we love and that is on trend for this season is under $50! Happy Monday! Who else is already looking forward to the holiday weekend? I'm ready to give this work week my all, but cannot help but get excited about Memorial Day weekend! Much like the 4th of July, I tend to think of this holiday as a weekend that's best spent by the water whether it's a pool or the lake. To make the weekend even more fun, I typically dress the part by wearing red, white, or blue. It's a good excuse to be patriotic! So today I've rounded up some of my favorite patriotic pieces for any occasion. Whether you're laying by the pool, sneaking away for the weekend, or just laying low, there's something for you! 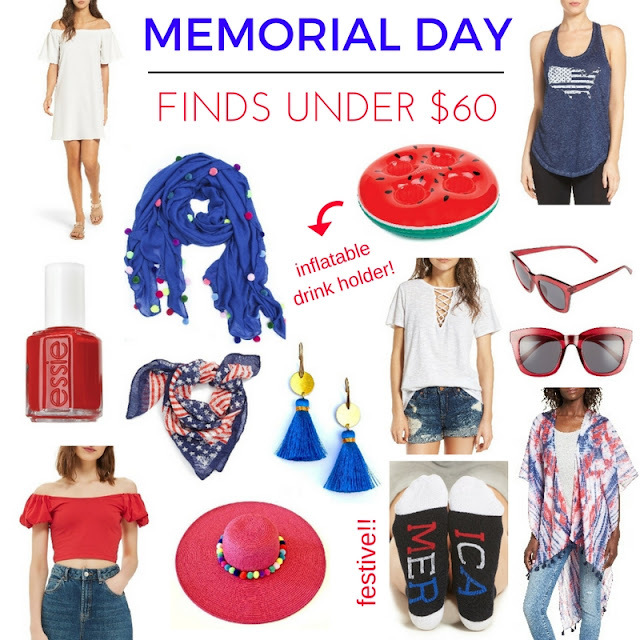 Most items are under $25, too! Happy shopping and be sure to let us know what you get! Spring House Update - Simply & Cost Effective! What is it about a change in weather that makes you want to completely redecorate your home? 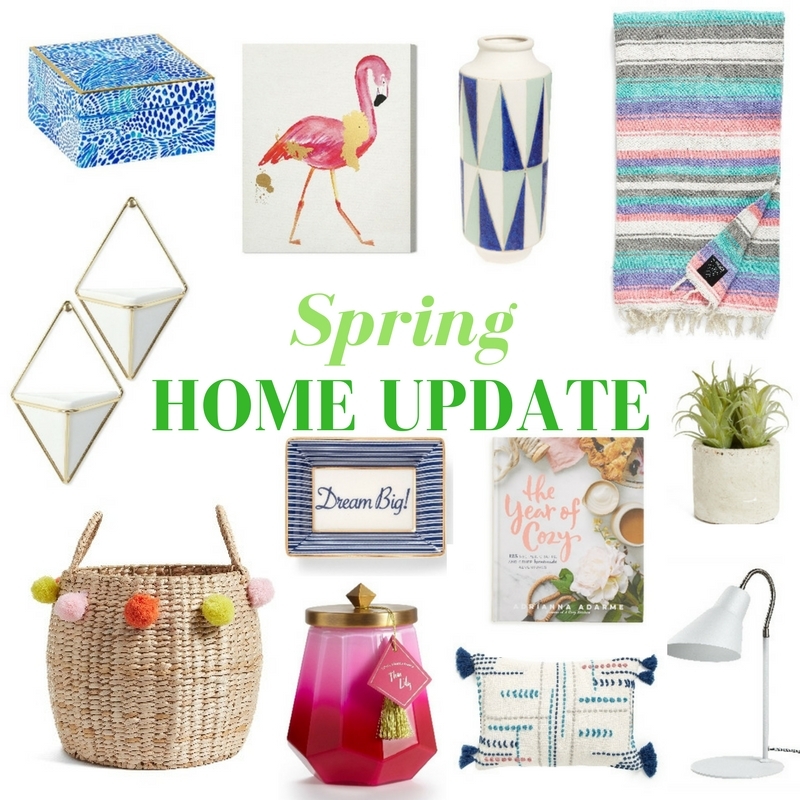 It seems like every time the weather gets warm i want to change out my lamps, get a new rug, etc., and then the same thing happens again when it starts to get cold in the Fall. Over the past couple of years I've learned that instead of squelching this desire altogether or spending tons of money redoing a room, there can some middle ground. Updating your smaller home decor, those little accents in each room is an easy and cost effective way to help your rooms and your home transition with the seasons. Some of the easiest things to change out happen to be some of the cheapest - things like your trinket trays or lamp shades. For example, replacing your trinket tray with this yellow one from Draper James would not only serve a practical purpose, but it would brighten your room. Another easy option would be to swap out your darker colored vases for a brighter, lighter colored one like this geo ceramic vase. Happy Tuesday!! Lately it feels like all I can think about is summer vacation. I love traveling in the summer because it lends itself to so many different types of excursions - beach trips, hiking in the mountains, camping trips, staycations, long weekend getaways, and just exploring some national hot spots. As I begin to prepare for some upcoming trips, I noticed I've found myself trying to find some items that are not only easy to travel with, but will make my travel experience lighter and easier. I want to invest in items that I can take with me no matter where I am traveling. 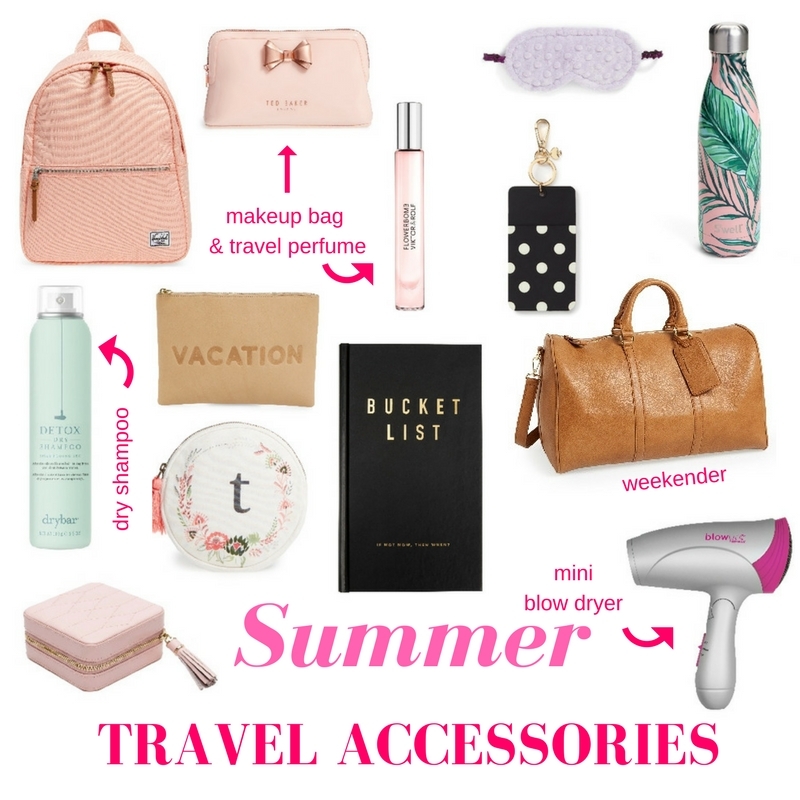 As I perfect my travel accessories, I wanted to share with you the go-to pieces I've found so far that will serve you well no matter your destination! PS - if you have any travel accessories that you can't live without, please let us know! We love learning about new products!